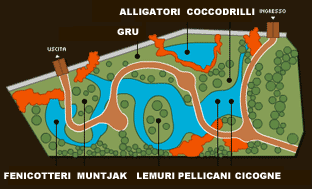 7000 sq.mt for 14 animal species and a catwalk to meet them up close. Visitors are able to walk on the catwalk and discover all the inhabitants of the Torpical Forest. Straams, pools and a rich vegetation recreate the natural habitat of these animals.